- Publisher Fleming Rutledge's first book, The Bible and the New York Times, has been hailed for its up-to-the-minute relevance to contemporary life. With this new volume Rutledge speaks directly to readers who are plagued by doubts and uncertainties about Christian faith. Among the host of challenging questions she addresses are: Doesn't everyone have their own idea of God? What if I'm not very religious? Can we still believe in the Resurrection today? Rutledge's approach has been described as a combination of pastoral warmth and intellectual fearlessness. She aligns herself with the struggling questioner as she faces the most penetrating theological challenges of our day. At the same time, she entrusts herself as a preacher in this new millennium to the explosive force of God's Word. Duke University chaplain William H. Willimon, in choosing one word to characterize her, selected "biblical". Provocative, learned, and displaying the elegance of expression for which Rutledge is well known, Help My Unbelief offers satisfying answers for those struggling with faith and doubt in our modern world. Fleming Rutledge's first book, The Bible and the New York Times, has been hailed for its up-to-the-minute relevance to contemporary life. With this new volume Rutledge speaks directly to readers who are plagued by doubts and uncertainties about Christian faith. Among the host of challenging questions she addresses are: Doesn't everyone have their own idea of God? What if I'm not very religious? Can we still believe in the Resurrection today? Fleming Rutledge is an Episcopal priest now engaged in a nationwide ministry of preaching and teaching. Her other best-selling books have been widely acclaimed across denominational boundaries and have established her reputation as one of America's finest preachers. 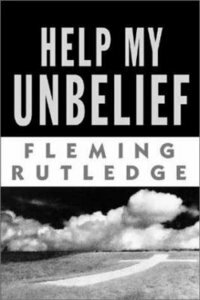 Titles by Fleming Rutledge include Help My Unbelief; The Battle for Middle-earth: Tolkien's Divine Design in The Lord of the Rings; The Bible and The New York Times; The Seven Last Words from the Cross; The Undoing of Death and Not Ashamed of the Gospel: Sermons from Paul's Letter to the Romans.